I have extremely dry skin that needs a lot more moisturizing than most peoples’ — especially in the winter months. After reading some recommendations on body lotions and moisturizers that make your skin really soft, I clipped some pages from a couple of magazines I read and respect — and I headed to the store to buy them. I was determined to try some of the newer body lotions that are supposed to make even extremely dry skin feel silky smooth. By George, I think I’ve found it! During this trial, I actually found a handful of dry skin body lotions that I like. One that I don’t. One that’s a great dry skin oil for the face. And a bath & body wash that works great for dry skin. In all, I tried 9 dry skin moisturizers — 2 that I already had on hand and 7 new ones. I have 2 extra-large bottles of body lotion for dry skin that I’ve been using semi-regularly over the past year. Become less effective over time. Even turn rancid after awhile. That said, neither of these 2 body lotions smells as good as my new favorites do (listed below). Nor have they ever made my legs feel silky smooth. I would say that “slightly more hydrated” is the best result that I’ve achieved from these 2 body lotions. Compared to the lotions for dry skin that I test below, these 2 moisturizers seem very “plain” (thin and watery). I placed one product on one leg and another product on the other leg. Then I waited the entire day, making mental notes of how each one was doing and if one body lotion was better than the other on my dry legs. I’ve heard that Keri products tend to work really well, so I’ve actually been on the hunt for Keri Advanced Dry Skin Lotion that has been mentioned on talk shows and in magazines for awhile now — to no avail. I think Keri changes their formulations (and their product names and bottles) frequently, making them extremely hard to find months later! Such was the case again this time, as well. The 2 stores I visited (Walgreens and Target) didn’t have the Keri formulation that was mentioned in the magazine, pictured above. Since I couldn’t find Keri Long Lasting Hand Cream, I grabbed what I thought sounded like the next best thing: Keri Renewal Serum for Dry Skin. The results were not good! Minutes after applying it to one leg, that leg still felt dry. Hours later… the results were nonexistent. I believe this product is probably meant to work over time, rather than overnight. But I wanted immediate results instead. Perhaps the Keri Intense Hydration Lotion would work better for extremely dry skin — but I haven’t tried that one yet. This moisturizer for dry skin smells really good — so I liked it right away for that reason alone. But the best part came after applying it to one leg. This body lotion truly made my leg feel silky smooth — and no greasy hands! Plus… that hydrated, soft feeling lasted forever! Even the next morning, the leg with Dove Cream Oil Body Lotion honestly still felt like I had applied the moisturizer minutes ago. I didn’t think I could find a better body lotion for dry skin than this one. The Jergens Naturals Hydrate Daily Moisturizer is a bit thicker than the Dove Cream Oil body lotion. That means it’s probably got a tad more of “the good stuff” — whereas the Dove product probably contains more “water”. I don’t like the scent of the Jergens nearly as much as the Dove Cream Oil, but that’s not a deal-breaker. The Jergens bottle says the key ingredients are: Jojoba oil, Agave extract, and Cactus extract. Like the Dove Cream Oil body lotion, I didn’t have greasy hands after using the Jergens Naturals moisturizer either! It’s next to impossible to tell which lasts longer — the Dove Cream Oil body lotion or the Jergens Naturals Hydrate lotion. That’s why I’m content with a bottle of each — one at my work desk for daytime moisturizing, and one near the bed for nighttime moisturizing. Without a doubt, the Jergens was the better buy. I found a huge 16.8 oz bottle on sale at Walgreens for $6.99. The Dove was $7.99 for 13.5 oz at the same store. Without a doubt, I prefer the Dove Cream Oil body lotion for dry skin. But the Jergens Naturals lotion is an economical backup that I always keep on hand. I tend to use the Jergens when my skin isn’t super dry. Also, since your skin tends to get used to products (just like your hair does), making them less effective over time — I now switch up my daily moisturizing routine a bit by rotating body lotions occasionally. I sometimes use Eucerin Dry Skin Therapy Calming Creme all over my body at night, and the Dove Cream Oil Body Lotion (mentioned above) all over my body during the day. They’re both great lotions for very dry skin! The Eucerin is slightly more greasy going on, but it doesn’t stay greasy for long — just about a minute or so. It’s especially great after a sunburn, anytime my skin has started to break out, and in the winter when my skin is exceptionally dry and I’m spending a lot of time indoors with forced-air heat. 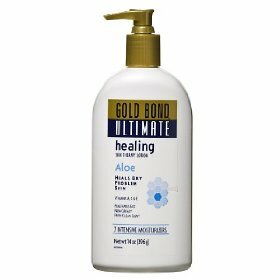 I love Gold Bond Ultimate Healing Skin Therapy Lotion (with aloe) for extremely dry skin too! Whenever my summer skin is super dry, I use it daily. The best part: It has absolutely no greasiness to it! Your skin feels so plump and soft immediately after using this body lotion for dry skin. I also don’t have to apply it as many times throughout the day — it generally lasts longer than other dry skin lotions do. I still use the Eucerin Calming Creme at night and in the winter months, but the Gold Bond Ultimate Healing Skin Therapy Lotion with Aloe works just as well as the Dove Cream Oil as a daily body lotion for dry skin. First Aid Beauty Ultra Repair Cream is a lot like the Gold Bond Ultimate Healing lotion for dry skin. It’s super-thick — that means it’s a more highly concentrated formulation than most other dry skin lotions. (Much like you’d find with night creams vs. day creams for your face… the thicker the better!) It’s clearly packed with all of the essential goodies that make it work so well on extremely dry skin. It’s not greasy at all — not for a second! And it seems to stay on even after a few quick hand rinses in water. First Aid Beauty Ultra Repair Cream works incredibly well on my dry skin year round. I used to think of Argan Oil as a makeup product — but really it’s a moisturizer for dry skin! And since it can be worn flawlessly under your makeup, it’s better than using a dry skin lotion on your face. Argan Oil is also great at healing cracked cuticles, moisturizing dry heels, repairing split ends, and even lengthening & strengthening your own natural eyelashes over time. I’m speaking from experience — I use it in all of those ways! Basically, Argan Oil is a multi-purpose wonder oil that’s appearing in a bunch of different health and beauty products these days — and for good reason. I’m so excited that my extremely dry skin is finally plump and soft to the touch year round! I’m no longer self-conscious whenever I shake hands with people — because my hands don’t feel dry anymore…ever. I no longer have dry skin patches on my face. My legs don’t look chalky when I’m wearing shorts in the summertime. And my arms & legs don’t feel like snake skin when I’m indoors with the heat on during the wintertime. I don’t use the Aveeno Daily Moisturizing Lotion anymore at all. Only when I find a great deal on Jergens Ultra Healing Extra Dry Skin Moisturizer or Jergens Naturals Hydrate Daily Moisturizer do I buy it. I tend to apply the Jergens randomly whenever my skin isn’t at its worst. Lightly pat Argan Oil onto my entire face, neck, hands, and feet. Thoroughly moisturize those same areas and all other areas of my body with one of the lotions for dry skin from my list of faves (above). Together, the oil and the lotion are the perfect combination for my (formerly) dry skin! Thanks to these lotions — combined with a moisturizing body wash in the shower — my extremely dry skin now stays super-hydrated all day long! These 8 lotions were tops in our tests. They all did a good job, leaving skin slightly more moisturized after 5 hours than the others we tested. All except the Eucerin had no scent or a slight floral aroma; a bit of a drag, and some left only a slight waxy film on skin. All took a while to rub in, except the Gold Bond, which went on quickly. Note that all are name brands except for Walmart’s Equate; the other store brands didn’t perform as well. I recently added body oils to my dry skin moisturizer routine! Here’s how to hydrate severely dry skin + the best body oil for dry skin issues. Since Dial Yogurt Vanilla Honey Body Wash was featured in the same magazine as the dry skin moisturizers, I decided to try a new shower soap too. I like it! If you don’t mind smelling like a candle all morning (until the scent wears off), then you’ll probably love this body wash. That said, I actually do like the smell. And it really does leave your skin feeling silky smooth as you step out of the shower. It’s almost as if there’s no way to rinse it off! That’s not a bad thing though — I like the extra-moisturizing effect. The only other shower soap that ranks close, in my opinion, is Dove Deep Moisture Body Wash. I currently alternate between the 2 — because they’re both really great (and hydrating) for dry skin. NOTE: I tried to find the Bamboo Body Sponge shown in the magazine article as well. The article says it’s available at Walgreens — but the 2 Walgreens in my area don’t carry it. I am thinking about trying this Charcoal Body Sponge. Now, if only I could find a deodorant that I’m just as comfortable with! I flip-flop across deodorant brands and have tried so many — yet none strikes my fancy as “the best” deodorant. Anyone have recommendations?